Cleveland-Cleveland and New York are two franchises who have not experienced much success this season. The Cavaliers (6-21) and Knicks (8-20) both come into Wednesday night as two teams headed towards the NBA lottery next June. This season is focused around the development of two guys who were selected just one pick apart last summer, rookies Collin Sexton and Kevin Knox. New York fans are dreaming of a summer in which a top five pick and Kevin Durant join their team, while Cavs fans are bracing for a long rebuild. Cleveland and New York both have to be pleased with the play of their lottery picks. After being inserted in the starting line-up Collin Sexton has grown much more comfortable being the engine that leads an NBA team. 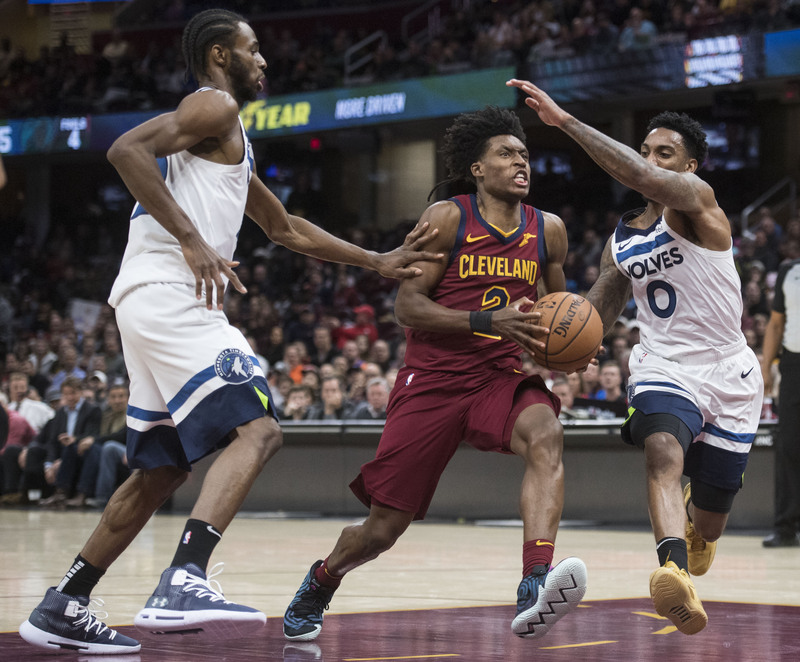 In 18 games as the Cavaliers point guard, Sexton is averaging 18.6 points, but struggled Monday in Milwaukee. Monday night’s 15 points snapped a three game stretch in which the Cavaliers rookie scored over 20 points. Cleveland coach Larry Drew mentioned post-game Monday in Milwaukee, how Sexton needs to impact the game even when he’s not shooting well. Losing to the Bucks wasn’t the only that happened to the Cavaliers Monday, they also lost Tristan Thompson until 2019. Thompson suffered a foot injury, after landing on Malcom Borgdan awkwardly. A few Cavaliers were also brought up in trade reports as the NBA season progress towards the February deadline. Without Thompson, Larry Nance Jr will be tasked with filling the shoes left by double T. Following shoot-around Wednesday Nance Jr spoke about the absence of Thompson. Cavaliers Koby Aultman has been rather busy the last few weeks, trying to re-construct the Cavs roster. Last week it was a trade with the Milwaukee, a few weeks ago it was sending Kyle Korver to Utah. Now according to Brian Windhorst of ESPN, the Cavaliers Burks and Hood could be trade candidates once they become trade eligible on December 15th. Hood and Burks were both acquired from the Jazz within the last year, but could be on their way out already. The two of them each hold more trade value than Smith, and could bring in future assets for Cleveland as it continues it’s rebuild. The market for each player is different, with Smith being the most likely being the most difficult to trade. Cleveland has been trying to trade Smith since the shooting guard publicly requested a trade. Smith was last with the Cavaliers November 19th, both sides decided it was best he step away from the team. Smith has been linked to the Houston Rockets and New Orleans Pelicans in recent days. The Knicks situation is different than the Cavaliers, as its built on hope. New York always has the ability to dream big, regardless of reality Knicks fans always feel as if their one move away. Kevin Durant signing with the Knicks next summer would change the landscape of the NBA, but right now Knicks fans focus is on Kevin Knox. The former Kentucky Wildcat is one of a few pieces the Knicks hope to build around. Knox is still coming off the bench in New York averaging 20 minutes a game, but has turned a corner since the calendar flipped to December. This month Knox is averaging 15.6 points on 39 percent shooting. Sunday against the Charlotte Hornets, Knox scored a career high 26 points. With Kristapas Porzingis still sidelined, the Knicks have been searching for answers throughout their roster. A common trend throughout the roster, youth. The Knicks rotation has no one over the age of 26, with seven guys being under the age of 23. The goal this season for New York is to figure out which of those guys is worth keeping around going forward to pair with Knox and Porzingis.